Hello! My name is Leonie, I am 18 years old and from Germany and I had the great pleasure of accompanying Opening Doors for 1 ½ months as an intern in the dance department. 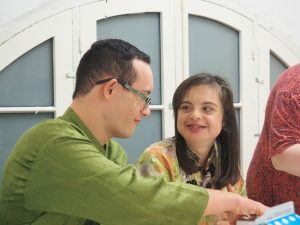 I didn´t really have any expectations coming to Malta, firstly because this plan came up very spontaneously and also because this was my first time working with people with learning disabilities. Therefore, I didn´t really have so much time to make up my mind, nor could I really imagine what the sessions or the process would be like. So, when I went to the first dance lesson at the Alison White Studios, I was very curious and a bit excited. But my first impression already showed me something that would make the whole time in Malta very easy for me: the impressive straightforwardness and cordiality of both members and group leaders. They gave me a very warm welcome, coming straight up to me to introduce themselves and asking me what I was doing here. After talking for a bit, we danced together. I could see that the structure of the sessions wasn´t very different to the ones I was used to back home: after a warm-up we did some diagonals, for example, some jumps or gallops, and then we would do a short combination, following the instructions of Ms Alison. In the modern/contemporary sessions with Rachel on Fridays we also often worked on partnering and floorwork. And what I personally liked the most was that we always watched a dance video, which varied in style every week, and then we did an improvisation inspired by the video we had just seen. I loved watching the videos Rachel chose and then seeing the other dancers interpreting the movements in their own way. My task during the sessions was to support the teachers in every way, mostly by giving personal and individual corrections to the dancers, so for example, showing the exercise again or helping them if they were struggling to do a movement. It took some time for me to see which person needed support. Some might have needed to see the exercise again to do it, and some might have to be motivated a bit until they showed their full potential. For this, it was very helpful to observe the interaction between the group leaders and members and also to get to know the different personalities more. I happened to be really lucky, because I also came just in time to be part of the Opening Doors Ensemble production: “The Secret”. The rehearsals for the production took place every Wednesday, and I was especially happy because it was a possibility for me to gain insight also into the Opening Doors theatre and the music groups. It was very beautiful to follow the process and to see the piece come to life. I experienced the process in quite a special way, because with every rehearsal I got some more information, it was a bit like treasure hunting: During the first rehearsal, I joined the music group and their group leader Luke, so I got to know the music. Then I saw the dancers and the music together, so I learned a bit more about the play, but I still couldn´t figure out the whole story. I think it was the third or fourth rehearsal when I got to watch a full run with dancers, musicians and actors and I finally understood everything. And even if it was just in a small room with no stage or costumes, and even if there were some little mistakes or correction breaks every now and then, the piece still managed to enfold its magic to me. I was really touched by the story, because I think it covers many different themes and questions that the spectator can relate to, like friendship, love and what makes a valuable life. For me it was especially the story of Rose which captured me, a girl who wants to be herself, but doesn´t really know who she is yet. Since I just finished Highschool last year, that’s quite exactly how I feel right now. So, after weeks of rehearsals, the week of the production came: I think for both the performers and the group leaders it was very exciting to finally be in the theatre, to see the stage setting and to have their costumes and makeup. An expectant, excited tension started to build up. You could really feel how much it meant to the performers to be on stage, how much they enjoyed the days in the theatre. Before the first performance, Rachel asked the dancers what they wanted to show on stage that night, what they are performing for. The dancers had very different answers, Maria said she wanted to share some of her favourite moves and she was also really happy to have people come and watch her. Sylvana was looking forward to the applause and the “well done”, while Saviour was happy to get some great pictures. Peter said he wanted to show that night what he, as a person with Down syndrome, is able to do. I think what all these answers have in common, is that they want to be seen. It is quite an overwhelming feeling for everyone to have an audience to come and watch you doing what you love, because they are interested in seeing you. But for people with disabilities, who tend to be overlooked or not taken seriously in daily life, this experience is even more important and special. And in my opinion, this is the most important success of Opening Doors, giving people with learning disabilities visibility. 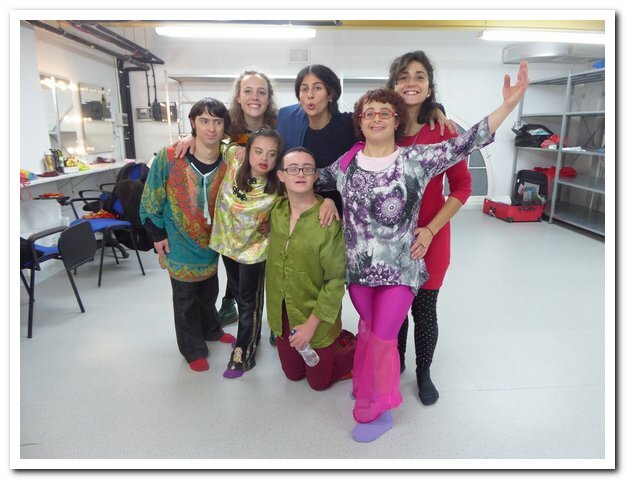 A space, where their “role” in the first place is not being a person with a disability, but a performer. That’s a matter of respect to me, because their capability of being artists is being acknowledged, because it shows that they are taken seriously. And I could see what this environment of respect and trust did to the dancers, musicians and actors. It gave them confidence, they felt special. This feeling, that they just love being on stage and performing, was also conveyed to the audience. The performance itself gained a special energy, the joy was contagious. I was so happy after the three very successful performances, because it felt like the performers gave their very best, and they also managed to get a little bit better with every show. When I tell people about my internship with Opening Doors, they mostly assume, that the dancing, acting and making music is for therapeutic purposes. Of course, it is, because it is always therapeutic in a way. All these things are good for the soul of every human being, I´m one hundred percent sure of that. 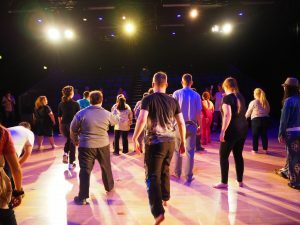 But I would say the aim of Opening Doors is to open doors for people with learning disabilities to parts of life where they are often excluded from: the performing arts. Because they are sometimes looked at as not being capable of making art. Justin, a member of the acting group, said to me: “some people treat us like animals.” That made me sad, but I think Opening Doors does the best they can to prove these people wrong: for me, one of the most beautiful and distinct ways to celebrate being human, is to make art. To dance, to act, to make music. Giving people with disabilities the chance to do that and to perform, is, like I said, a sign of respecting them as the equal human beings they are. I could not finish this article without saying how deeply impressed and inspired I am by the group leaders of Opening Doors. 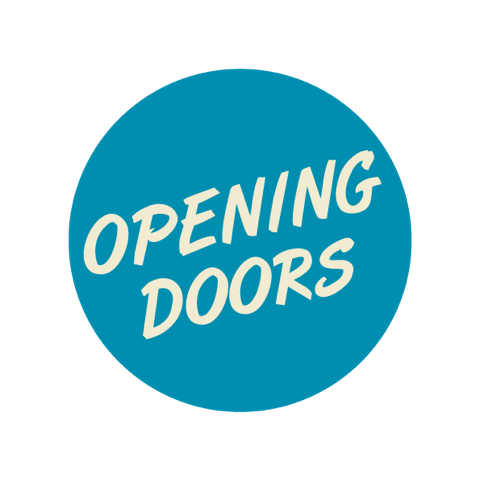 Luke Baldacchino, the leader of the music group, writes in the 2018 publication of Opening Doors: Opening Doors to the Performing Arts: Difference and Diversity: “One mantra I strongly believe in as an educator is: `I teach the student, not the subject.´” After observing the sessions of Opening Doors for 1 ½ months, I can 100% declare this to be true. The teaching is very respectful and patient, always with great empathy but also the right strictness to push the members to always give a little bit more and of course to maintain basic rules like punctuality and manners. And furthermore, all the group leaders are part of Opening Doors because they are convinced of this project. So, the energy they give is really positive and contagious. I feel that I learned a lot about what is needed to be a good teacher during my time in Malta. Last, but definitely not least: a big, big thank you to all the members. You made it so easy for me to integrate fast due to your openness, your friendliness and passion for what you are doing. I will definitely remember all of you, and I hope to see you again very, very soon. Grazzi ħafna for this wonderful experience. For me, it felt like I was at the right place at the right time with the right people.